"Our mission has been to spread the 'joy' of Bluegrass, and this show will certainly help us bring this iconic American musical style to many new listeners," says Lee. The duo has enjoyed enormous success at radio and at retail, and Elaine calls the new show "an incredible opportunity." The episodes will be presented in true "variety" format, with each show including a performance by The Roys, humanitarian features, a festival event highlight segment, plus a guest musical artist, interview, and a closing jam session. Roots And Music With The Roys will focus on Bluegrass and Acoustic Roots formats. The Roys are uniquely qualified to act as ambassadors for their genre; the duo was recently named 2011 Inspirational Bluegrass Artist of the Year at the ICM Faith, Family & Country Awards show, and were previously honored with the ICM's Duo of the Year Award in 2010 and 2009. Their recent hit, "Coal Minin' Man" rocketed up the Bluegrass charts, landing at #1 on Power Source's Bluegrass Top 35 Chart, #1 on HotDiscInternational Top 40 Chart, #3 on Bluegrass Unlimited’s National Bluegrass Survey and #4 on Bluegrass Music Profiles’ Top 30 Singles Chart. Following their return from Australia, The Roys will launch a busy U.S. touring season, which includes festivals and fairs and co-hosting duties at the Christmas 4 Kids Celebrity Golf Tournament with Tennessee Titans’ Rob Bironas in April. Fans can learn more about Lee and Elaine at www.theroysonline.com. Formed in 1983 and based in Clearwater, Florida, ValCom, Inc. is a diversified, fully-integrated, independent entertainment company. Through its operating divisions and subsidiaries, ValCom, Inc. creates and operates full-service facilities that accommodate film, television and commercial productions. The company's four divisions comprise television and film production, broadcasting (My Family TV Network), distribution, and live theatre. ValCom's client list consists of major industry players such as MGM, Paramount Pictures, Warner Brothers, Disney, CBS, Sony, NBC, Phantom of the Opera, HSN and more. Helmed by Chairman and Chief Executive Officer Vince Vellardita, ValCom, Inc. has acquired property and studios in Las Vegas, Los Angeles, and Palm Springs. Vellardita has been instrumental in acquiring over 10,000 titles of Film and Television series, and ownership of television station KVPS (Palm Springs). ValCom, Inc. maintains long-term relationships with Paramount Pictures, CBS television’s “JAG” and “NCIS” series, andWalt Disney’s Sabans “Mighty Morphin Power Rangers.” Vellardita began his career as a fast-paced music producer and promoter of over 200 live events and concertswith some of the biggest acts in the world. He has also produced a Special White House Presidential Campaign, the Super Bowl 2006 Motown Rap Show, The Beach Boys 40th Anniversary Special, an MGM Grand Special, and the 50th Anniversary of Michel Legrand and Friends show. NASHVILLE, Tenn. –The Nashville Music Garden’s first-ever “Country Music Blooms Online Auction,” which launched on Black Friday, November 25 and continued through Monday, December 5, raised more than $15,000, to help sustain the garden and continue to help keep Nashville beautiful. All proceeds from the auction benefit the Nashville Music Garden Fund of The Community Foundation of Middle Tennessee, which endows the future care and support of the garden so the community, Country music fans and visitors to the city can enjoy it for generations to come. The auction, which featured a unique selection of celebrity-owned items – straight from the closets of Country music’s finest – was held on eBay so that garden and country music enthusiasts from across the world could have the opportunity to acquire one-of-a-kind items from their favorite celebrities. Bidders across the globe from the United Kingdom to Thailand, as well as across the United States, from New York to Florida and from California to Massachusetts, bid vigorously throughout the auction. In the end, the lucky winners landed exceptional holiday gifts for the country music lovers in their lives and incomparable keepsakes for their own collections. The auction certainly encouraged the holiday spirit and generous supporters helped the Nashville Music Garden exceed fundraising goals. “With the success of the auction, thanks to the incredible generosity and support of the bidders and the celebrities who donated items, the Nashville Music Garden will continue to grow and thrive,” said Ellen Lehman, president of The Community Foundation of Middle Tennessee. The success of the inaugural auction is undoubtedly the result of the thoughtful donations of many esteemed country legends and hot contemporary stars, who not only graciously donated priceless personal keepsakes and treasured memorabilia, but who also helped promote their items as well. These include: Barbara Mandrell, Brenda Lee, Brooks & Dunn, Carrie Underwood, Christian Kane, Danny Gokey, Darryl Worley, Darius Rucker, Faith Hill, Keith Urban, Kenny Chesney, Kristen Chenoweth, Lady Antebellum, LeAnn Rimes, Little Jimmy Dickens, Love and Theft, Manuel, Martina McBride, Miranda Lambert Pam Tillis, Sara Evans, Scotty McCreery, Sugarland, Tim McGraw, Tennessee Titans running back Chris Johnson, Zac Brown Band and many more. The auction was also made possible by the extra support offered by Anderson Design Group and Spirit of Nashville, Fontanel Mansion & Farm, Jaime Dudney, RFD-TV, Tessa Atkins, The Community Foundation of Middle Tennessee, The Country Network (TCN) , and by all of those who bid on items. Merry Christmas from the Scoops Staff! We are proud to present December’s Issue,”The Gift of Grace!” We are excited to feature The Bowling Family, Gloria Gaither, Marshall Hall, Christy Sutherland, The Diplomats, Scott Godsey, Amber Nelon, Rachel McCutcheon and Karen Peck. This issue includes New Music Reviews by Sandi Duncan Clark, Jennifer Cambell’s Women of Faith Experience, Stephanie Kelley’s trip to the Flight Museum, Inspiration from Lou Wills Hildreth, Encouragement from John Mathis and Rhonda Frye and a concert review on Voices Won Anniversary Singing. Rob Patz gives a little hint about the Diamond Awards location, Lorraine Walker wraps up a 3-part series on “Media and the Gospel” and Laurette Wills shares how we can stay fit during the holidays. We hope you enjoy the beautiful cover designed by Stephanie Kelley and the Magazine layout design by Pete Schwager. Enjoy our Christmas treat and please share it with your friends! has recently received the honor of being voted 2011 Country Gospel Connection Choice Awards Duo of the Year. This award is determined by a panel of music industry professionals and is based on Heart To Heart’s excellence in promoting the Gospel of Jesus Christ through Christian Country Gospel music. Heart To Heart has also just learned that their original song, “Father Who Cares,” written for America’s Got Talent finalists Voices of Glory, has been nominated for a Dove Award! Heart To Heart are singers and songwriters with original songs on the charts and receiving airplay worldwide such as “That’s Why I Cry,” “See a Rainbow,” “Father Who Cares,” “Rock of Ages, Roll On,” “My Little Boy” and “Where Tears Won’t Fall.” They have twice been voted awards for Song of the Year by the Gospel Music Association in Nashville and were GMA Duo and Vocal Group of the Year last year. Heart to Heart hosts their own radio show called “The Branson Gospel Groove” which airs on several stations to include VoicesofGlory2020.com, ToPraiseHim.com, HeirwaveRadio.com and CGCRadio.com. Heart To Heart not only performs regularly on two Branson stages, The Night Light Beacon of Branson (owned by the Barbara Fairchild family) and Branson Radio Live with Karen Berka at the Branson Mall Centerstage, they are members of GMA, ICGMA, CGMA, SGMA and ICMA and tour the country when not on the Branson stage to serve churches, schools and communities. Sharon comes from a musical family. Her dad, Leon Barnett, was the lead guitar player for Narvel Felts & the Rockets “back in the day,” and guys like Roy Orbison, Conway Twitty, Carl Perkins and Chet Atkins ran through her house when she was four or five years old, always getting ready for the next “gig.” Jerry grew up on a farm in rural Missouri and didn’t know he could sing until he met Sharon! Together, they are forging a legacy in Gospel music with their powerhouse vocals, amazing connection with their audiences and dedication to their Calling; and the industry is definitely taking notice. You WILL be hearing more from Heart to Heart – that’s for sure! For more about Heart to Heart, visit their website at www.hearttoheartmusicgroup.com. Nashville, TN – Jeff & Sheri Easter believe it’s important to make and share good memories, and that’s exactly what’s happening right now at their official Facebook page! Jeff & Sheri are hosting the “Lifetime of Jeff & Sheri Easter Music Giveaway.” Gospel music favorites Jeff and Sheri Easter want to give their fans the opportunity to share their favorite Christmas memory and a chance to win a 10 CD library of Jeff & Sheri’s music spanning their career through the Facebook contest. To enter the contest, go to www.facebook.com/JeffAndSheriEaster and share your favorite Christmas memory underneath the video. Then, invite your friends and family to visit the page and click “LIKE” under your memory. The story with the most “LIKES” will be the winner of the CD library. The contest started on December 6, 2011 and runs through December 31, 2011 at Midnight and is now open to all friends of Jeff & Sheri. Log onto www.Facebook.com/JeffAndSheriEaster and don’t forget to click the “LIKE” button! MOUNTAIN VIEW, Calif. Hexify, the developers of the first Biblically-based Facebook game, Journey of Moses, is launching Lightside Games to focus on creating games specifically for the Christian audience. "Lightside Games' core mission is to create high-quality, engaging Christian social games by leveraging the world's biggest technology platforms to reach gameplayers all over the globe," said Brent Dusing, Chairman and CEO of Hexify and Lightside Studio Head. "Authenticity is core to what we do at Lightside. Stories and themes from the Holy Bible are the foundation of our games. We strive remain true to God's message." Lightside, a wholly owned studio of Hexify, will continue to produce high quality Facebook games that incorporate fun gameplay, quality graphics, great music and the newest Facebook social features. Plans include games that focus on both New and Old Testament stories and themes. Lightside Games will be free to play while players can purchase goods along the way to help enhance their experience. "There are all types of games online -- games about monsters, zombies, mafias and farms. At Lightside, we make games about the Bible," said Dusing. "We transform the Biblical stories that many of us hold dear into fun, entertaining and uplifting games." Hexify, the parent company of Lightside, launched Journey of Moses, to meet a void in the market for a biblically based game in August 2011. Players experience the many twists and turns as they explore milestones in the life of Moses -- from growing up in the king's house as an Egyptian to his exile in the wilderness. Then, after an encounter at the burning bush, Moses' life is changed and he eventually leads the Israelites out of Pharaoh's rule. For more information about Lightside Games, visit www.hexify.com. Who would you like to see in SGNScoops magazine? We are working together at SGNScoops to intentionally plan an awesome year of stories and articles. Rob and I have been working closely with our staff regarding content planning for 2012. We want to hear from YOU as well. Who would you like to see in the magazine? What other stories interest you? Email us your ideas and suggestions at connect@sgnscoops.com. We want to Connect with you! Lou Holtz Announced as Keynote Speaker for 2012 “Choose to Win” FCA/Sports World Ministries Banquet in Bonita Springs, Fla.
Lou Holtz, retired football coach, active sportscaster, best-selling author and motivational speaker, has been announced as the keynote speaker for the “Choose to Win” banquet on Saturday, January, 21, 2012. Sponsored jointly by the Fellowship of Christian Athletes (FCA) and Sports World Ministries, the banquet will be held at the Hyatt Regency Coconut Point in Bonita Springs, Fla. Tickets are available at www.choosetowin.ticketleap.com or call 239-784-3377 for information and sponsorship opportunities. Holtz served as the head football coach at The College of William & Mary, North Carolina State University, the University of Arkansas, the University of Minnesota, the University of Notre Dame, and the University of South Carolina, compiling a career record of 249–132–7. Holtz's 1988 Notre Dame team went 12–0 with a victory in the Fiesta Bowl. He is the only college football coach to lead six different programs to bowl games and the only coach to guide four different programs to the final top 20 rankings. On May 1, 2008, Holtz was elected to the College Football Hall of Fame. “We are very excited to partner with Sports World Ministries for this evening featuring Coach Lou Holtz as we work together to encourage students to make positive choices. Sports World provides former professional athletes to deliver the message, “You’re not born a winner. You’re not born a loser. You’re born a chooser.” The Fellowship of Christian Athletes follows up on that message by working with students on school campuses to equip them to make the right choice by following the example of Jesus Christ,” said Gretchen Shelton, FCA Area Director. This uplifting and motivating event will include guest speakers, a silent auction, entertainment, dinner, and dynamic video presentations. Tickets will go quickly, visit www.choosetowin.ticketleap.com today or call 239-784-3377 for more details. The current edition of Gospel Music Today includes a visit to the Deep South Quartet Convention, in Springfield, MO, to hear Faith's Journey sing. The Feature Group is New Covenant Trio, and Ken and Jean Grady host southern gospel news and concert updates. Jean reviews a new CD by 11th Hour, and the show features special Christmas music by Tribute Quartet, Karen Peck and New River, and The Williamsons. The latest show is online now at the Gospel Music Today website, www.gospelmusictoday.com. Merry Christmas from Ken and Jean! The Rick Webb Family’s “The Glory and Majesty of Christmas” tour, along with their 30 member cast, was on the road this year during the month of December. This is the 4th year this production, written by Disney veteran musical composer, Derric Johnson has been The Rick Webb Family’s Christmas tour. The show was produced exclusively for the Blue Gate Theater in Shipshewana, Indiana and that is where the tour made its final stop. The show sold out in record time with more than 2,000 attending. The Rick Webb Family is projecting an unprecedented year of music ministry in 2012 as they celebrate their 30th year of touring and recording in music ministry! NASHVILLE, Tenn.—For Guy Penrod, one of gospel music’s best-loved vocalists, 2011 marked a year filled with unforgettable milestones. Led by the continued multi-genre success of his 2010 solo debut, Breathe Deep, Penrod’s visibility and acclaim experienced new heights within both the Christian and Country Music arenas. Penrod is ending the year on a high note, having made his debut solo appearance on The Grand Ole Opry last month. As part of the Opry’s special Veteran’s Day show, the award-winning vocalist performed his current mainstream country single, “More Power To Ya,” and “Breathe Deep,” on the historic stage of Nashville’s Ryman Auditorium. Penrod’s acclaimed 2010 Servant Records/Gaither Music Group solo debut, Breathe Deep, continues to be a benchmark for country recordings within the Christian marketplace. Breathe Deep has sold more than 75,000 units to date, and has yielded successful singles in both mainstream country and southern gospel radio formats. During his 14 years with the GRAMMY® and Dove Award-winning Gaither Vocal Band, Penrod performed before more than 5 million people on Bill & Gloria Gaither’s Homecoming Tours and was featured on Gaither television specials airing on multiple networks. The Gaither Homecoming series and The Gaither Vocal Band sold more than 20 million CDs and DVDs while Penrod was a member. Prior to joining the Vocal Band, Penrod was a highly sought-after studio singer in Nashville and appeared for three years on TNN’s popular “Music City Tonight” as a vocalist in the house band. Penrod is looking forward to a full touring schedule in 2012, including performances at churches, theatres and special events throughout the country, as well as a European tour next summer. For a complete tour schedule and additional information, visit www.guypenrod.com. Adam and Rebecca Reynolds of Freedom s Crossing had the privilege to meet with country music legend, Vince Gill recently in Salem, VA. While living in the Nashville area, Rebecca s father hit the road with Gill as his tour bus driver. Since that time a strong family friendship has developed. One stop on Gill s tour schedule was a city near Adam and Rebecca s hometown in Salem. Vince called them with an invitation to come to the show and shoot the breeze afterwards. Adam and Rebecca said we count it a blessing and an honor to have spent this time with one of our musical influences . Adam and Rebecca are so grateful to Vince for his time, friendship, guidance and, above all, his humble heart. Nashville, TN - Catacomb Music has just released the music video for Song of David’s current radio single “One Step”, written by David Bryan. "I thought it was fun putting this music down on audio.... But now, the video has brought it to an even greater life! This video captures the true essence and joy that this song was written with. It not only looks like we are having fun living this life, we are! Don’t let anybody fool you; it’s not always easy, but it’s always right, so just keep walking", said David Bryan. TULSA, Oklahoma, If you are like most people, the name Oral Roberts will evoke a thousand different images. But, images can be manipulated - cropped, airbrushed, added-to and colored. A life as panoramic as that of Oral Roberts cannot be viewed from one perspective. Seen from one angle Oral Roberts is a far-sighted man of God who fused the "Old Time Religion" with the modern tools of communication and education. Seen from a different angle, he represents, for some, the retreat from the central tenets of the "Bible" to a market-driven, multi-media ministry. What made Oral Roberts such a divisive figure? Like all complicated stories, the truth lies somewhere beneath all the hype, hyperbole and hysteria. Now, the daughter of famed televangelist Oral Roberts has stepped out of the shadows to answer these questions about one of the 20th century's most enigmatic men. My Dad, Oral Roberts is an intimate, behind-the-scenes portrait of a man who literally held America spellbound, told by one who had a most unique viewpoint. The youngest of Oral and Evelyn Roberts' children, Roberta Roberts Potts directs the reader toward a more private side of her father, who began life in crushing poverty and went on to become a world-renowned Christian figure. And, while most who read this book have already formed some opinion of this iconic figure, My Dad, Oral Roberts will seriously challenge those opinions. Ms. Roberts Potts candidly and lovingly exposes the "clay feet" of this great man of God, as well as walking us through the trials and tribulations that she and her family experienced. Although many are familiar with the history surrounding her more well-known brother, Richard, many will be surprised and touched to hear about the lives of her other brother and sister. Truly, as had been said or paraphrased by different people, in many different ways, one should not judge another until they have walked in his shoes. My Dad, Oral Roberts, is destined to change the way we think about this man. Roberta Roberts Potts is available for interviews, public appearances and book signings. For enquiries please contact us at info@iconpublishinggroup.com. The book was published by ICON Publishing Group. For further information on this work or ICON Publishing Group, visit www.iconpublishinggroup.com. Is your teenager depressed? Do you know what to look for? Do you know the signs to look for? What’s going on with your teenager? Is it just the ups and downs of adolescence, or is it something more? In Dr. Gregg Jantz’s new book, (When Your Teenager Becomes) The Stranger in Your House, parents will learn to distinguish between normal adolescent behavior and clinical depression. The excerpts below from The Stranger House (© David C Cook) explain what to expect as regular teen behavior and what to be on the lookout for. I think the nearest comparison I could give to what I remember about being a teen and what I hear from teenagers about adolescence is that of a reptile shedding its skin. When a snake or a lizard sheds its skin, the new growing skin cells separate from the old established skin cells, causing a marked change in appearance and producing an irritability that can result in increased snapping and hissing. Of course, reptiles shed their skin relatively quickly, so the analogy doesn’t carry too far. Still, I think it’s fairly parallel. Your teenager’s nascent adult is separating from the confinement of childhood, causing a marked change in appearance and producing an irritability that can result in increased snapping and hissing. I think it’s why teens often feel like their skin is crawling and fight against a sensation of being confined, wanting to burst free. And it’s why parents often look at their teens as though they’re something that just crawled out from under a rock. Shedding skin is uncomfortable, often disturbing, and absolutely necessary for growth—and it’s the same with adolescence. It makes it easier, however, when you know what to look for and what it all means. Teenager adolescent behaviors are stereotypical for a reason—they are fairly consistent across generations. If you haven’t noticed many of these already, you will, in varying degrees, depending upon your teen. As we’ve seen in previous chapters, dealing with a teenager can be a dicey proposition in the best of times. On any roller coaster, part of the ride is taking that occasional plunge, but what happens when the drop becomes too steep or the ride veers off track? As a parent, your tolerance for a rough ride may be different from your teen’s. So how do you know if your teen is having a bad day or a bad week or something more? How do you know if the withdrawal and slump in grades are normal or something to worry about? How do you know if it’s just teen angst or something worse? How do you know if your teen is just unhappy because of a breakup or doing poorly on a test or if this unhappiness has spread to life in general? How do you know what you’re dealing with when your teen has become adept at avoidance? He’s quite capable of figuring out and telling you what you want to hear so you and your disquiet will quietly go away. She has the ability to block any genuine concern with a concussive and shrill blast of anger. Getting to the bottom of a problem you merely suspect and your teen barely understands is like catching smoke and trying to examine it in your hand. As tempting as it may be to give up the whole proposition of trying to catch smoke in the first place, there is the unsettling reality that where there’s smoke, there is often fire. This fire has a name: It’s called depression. Kids get depressed, just like adults. It’s something, as a parent, you need to be aware of and look out for. A depressed teen does not have the wherewithal, generally, to come to you for help, especially when one of the symptoms is isolation. If you’re waiting for your teen to come to you, you’re going to be waiting a long time, maybe too long. So you need to be proactive. Know the signs. Even though all kids are different, there are some specific things to look for, according to the National Institutes of Health’s National Youth Violence Prevention Resource Center (that’s quite a mouthful, but, luckily, the website is a bit shorter—SafeYouth.gov). No one of these signs is a definitive red flag that says, “Yes, your teen is depressed.” Rather, they form a pattern of concern. They should catch your attention and slow you down long enough to investigate the source of the smoke, even if you have trouble catching it in your hand. About the author: Dr. Gregg Jantz is the best-selling author of numerous books, including Hope, Help, and Healing for Eating Disorders. He is the founder of The Center for Counseling and Health Resources, a leading healthcare facility near Seattle that specializes in whole-person care. Rural Rhythm Records is proud to announce Cry, Cry Darlin’ from the album, I’M GOING BACK TO OLD KENTUCKY (A Bill Monroe Celebration) by Audie Blaylock & Redline, is #1 on Bluegrass Today’s Weekly Song Chart and #12 on the publication’s monthly chart. “Audie’s vocal solo on Cry Cry Darlin’ has that soaring high lonesome tenor that will send shivers down your spine,” says Brenda Hough with the California Bluegrass Association. It is no wonder that the album has been a huge hit with fans, radio and media with the wealth of talent led by Audie Blaylock who also produced the album. He is joined by Redline members: Patrick McAvinue, Reed Jones, and Russ Carson, with special guests Del McCoury, Ronnie McCoury, Bobby Osborne, Glenn Duncan, Carl Jackson, Lou Reid, and Jason Carter. Appointed By Grace consist of Joe Irwin, Melissa Evers, and Karla Burris. Joe, Melissa, and Karla offer a unique mix of gospel music singing styles. Joe has been involved in music ministry for over thirty years. Joe sang and played bass with a family group called the Woodromes for many years as they traveled throughout the southeastern United States. In addition to being Godly wives and mothers, Melissa and Karla have both been involved in singing ministries since childhood. God has gifted them as singers, songwriters, musicians and ministers. They have proven themselves to be dedicated to God and their families. Joe has served as an Associate Pastor and as a Youth / Music Director. He is now serving as an Evangelist. Melissa has ministered in various settings such as youth and ladies conferences, churches, camp meetings and concert halls. She has been the recipient of two national talent search awards and as a soloist, has opened for many well known gospel artists. She is currently the Worship Leader in her home church. Karla grew up in a family of talented singers and musicians. She has taught Sunday school, AWANA, and ladies bible studies in her home church. For the past thirteen years, she has been performing weekly at the Liberty Opry. Singing there has led to many opportunities for her to sing at community ceremonies, Senior Center programs, worship services and various church functions. Joe, Melissa, and Karla have appeared on numerous TBN television programs throughout the nation and have completed over twenty recording projects both as a group and separately. Free admission with a lover offering to be received for the group. The Family Guide to Movies and Entertainment will set a milestone next year when a superhero hosts its 20th anniversary celebration honoring family-friendly and inspirational entertainment. The Movieguide Faith & Values Awards Gala and Report to the Entertainment Industry honoring family-friendly movies and television programs and spiritually uplifting entertainment has announced actor Dean Cain as the official host of the 20th Annual Awards show. The event will be held Friday, Feb. 10, at the Universal Studios Hilton Hotel in Hollywood. “Dean Cain has one of the most faith-filled and blessed careers in the entertainment industry, so we are delighted that he will host,” says publisher and Gala founder Dr. Ted Baehr. Cain is most notably known as Superman, which he played for four seasons in the TV series, Lois & Clark: The New Adventures of Superman. His other TV credits include Beverly Hills 90210, Las Vegas, Smallville and the made-for-television movie The Perfect Husband: The Laci Peterson Story. He was host of the syndicated series Ripley's Believe It or Not, which his production company also produced. He has also been a presenter in the past for the Movieguide Awards Gala. Red carpet and VIP Reception will begin at 4:00 p.m. and dinner at 6:00 p.m. The theme for this years' event will be From Hollywood to Eternity. The star-studded gala takes place just prior to the annual Oscar Ceremony. Last year's gala was taped and then later telecast on The Hallmark Movie Channel. Among the prestigious prizes and awards handed out that evening will be the $100,000 Epiphany Prizes for Inspiring Movies & TV, the $50,000 Kairos Prizes or Spiritually Uplifting Screenplays by First-Time and Beginning Screenwriters, the Best 10 Movies for Families, the Faith & Freedom Awards for Positive American Values, the Grace Awards for Most Inspiring Performances in Movies & TV, and the Best 10 Movies for Mature Audiences, from teenagers to adults. During the gala, Baehr presents highlights of Movieguide's comprehensive analysis of the major movies released in theaters to show entertainment industry leaders attending what kinds of movies make the most money at the box office and on home video. Baehr is chairman of the Christian Film & Television Commission ministry and publisher of the Commission's family guide to movies, Movieguide. The Billy Graham Rapid Response Team has completed its 22 month deployment to the earthquake-stricken country of Haiti. Chaplains first arrived in Haiti within 24 hours of the Jan. 12, 2010, disaster that is estimated to have killed more than 300,000. More than 120 chaplains ministered in the impoverished nation during the nearly two-year-long endeavor, and those trained chaplains prayed with and comforted 35,420 Haitians and relief workers. Individual chaplains typically spent two to six weeks at a time in the country before rotating out. "We have witnessed the best and the worst that this world has to offer as we've ministered in Haiti," said Franklin Graham, president of the Billy Graham Evangelistic Association. "We've seen pain and grief on an unimaginably massive scale, and we've seen beauty, hope and joy in the spirits of the Haitian people that defies all explanation in the midst of such a hard place." Recognizing the ongoing need in Haiti for spiritual and emotional support, the Billy Graham Evangelistic Association has implemented many of its other ministries in the country over the last several months as well, including a Franklin Graham Festival held in January 2011, a My Hope World Evangelism Through Television program that reached the entire nation through grassroots efforts, and The Greatest Journey, a special educational program for children. A Creole translation of the youth training course Dare to Be a Daniel is also in the works for Haiti. The deployment to Haiti was the second-longest outreach in the history of the Billy Graham Rapid Response Team. Following Hurricanes Katrina and Rita in 2005, chaplains immediately deployed to the Gulf Coast and had a presence there for two-and-a-half years until concluding the effort on March 14, 2008. The Billy Graham Rapid Response Team is a nationwide network of chaplains across 44 states that are specifically trained to deal with crisis situations. Since the ministry was launched in 2002, it has responded to more than 120 natural and man-made disasters, including hurricanes, tornadoes, floods, fires and shootings. For more information on the Billy Graham Rapid Response Team, visit www.billygraham.org/rrt. For videos, photos and news articles from recent Billy Graham Rapid Response Team deployments, visit www.billygraham.org/response. Ministry updates and photo galleries are posted at www.facebook.com/BGRapidResponseTeam. The guests on the current edition of Gospel Music Today are the members of Beyond the Ashes. 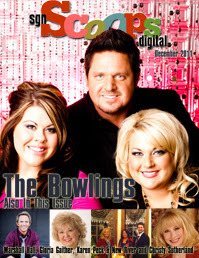 The Feature Group is Jaidyn's Call, and Ken and Jean Grady host southern gospel news and concert updates. Ken and Jean visit the Southern Gospel Worship Gathering, in Broken Arrow, OK, to hear James and Starla Dean sing. Jean reviews an new CD by Anthem Quartet, and the show features singing by The Whisnants and a vintage video with The Ruppes. The latest show is online now at the Gospel Music Today website. Before you get started remember: Do not underestimate the power of your home, nor its ability to change lives. Do not underestimate the power of one tiny, seemingly insignificant, act of kindness. A welcoming smile, a cup of hot tea and an hour in a cozy nook spent listening to a friend can be life-altering. Your home is a significant part of the way people will be touched, by God, through you this Christmas season. God uses us as his hands! Your table is the means through which you can touch others by setting the stage for memories to be made. A classic Christmas tabletop has to have red and green, plaid and sparkle, inspiration and encouragement. The red and green is an obvious choice, however sometimes it is easier than we make it. Collect red and/or green fruits and keep a glass bowl of them in a prominent place in the kitchen. You can add a few springs of ivy or pine to get really festive. Candies, such as M&Ms, come in red and green packages and in silver bowls makes any setting looks seasonal. Add red plates and greenery from your yard to complete the look. Since Christmas is the one time we’re all into plaid, use it on your tabletop! You can tie it onto a pretty cross (see pictures on blog) onto the top of a candlestick and make a beautiful statement about the meaning of Christmas while pleasing the eye with the sparkle of the candles! Tall candles in the center looks perfect, adding shorter candles towards the two ends allow guests to be able to see over the candles for conversation. Small votives add sparkle and a feeling of warmth and coziness. You can use a plaid scarf, runner or piece of fabric draped diagonally across the table for an overall Christmas look, while allowing the beauty of the wood tabletop (or glass) to show through. Lastly, and most importantly, the "Inspired" part of the table top design. Warming the souls of those within your home is perhaps the most important part of hospitality and the reason in Romans 12:13 we are told to Practice Hospitality. The easiest way to do this is keep a couple of framed quotes on the central part of the table, one towards either end. Not only can you do place cards with just names but think of an encouraging scripture or quote that reminds you of your guest or something that might encourage or inspire them. Praying over whatever is going on in a person’s life, not only releases the power of prayer, but lets them know you have been thinking of them and remembering their needs. In this time in our culture, what could be more inspiring! God bless and be encouraged! Hospitality can change our world one life at a time! FORT WORTH, Texas, Charlotte Posa's To Women with Love, a practical guide to overcoming the horrors of domestic abuse, was released on November 14, 2011. Mrs. Candy Abbott, managing partner of Fruitbearer Publishing, LLC, says the subtitle, Walking Away from the Abuse, was chosen to impact a tightly targeted audience. According to the Family Violence Prevention Fund, a woman is battered in the U.S. every nine seconds. The U.S. Department Justice's Bureau of Justice Statics Special Report states that 95% of all victims of domestic violence are women. For thirty-five years, Charlotte Posa experienced the devastating effects of parental and spousal abuse. Through (a chance encounter -- or what circumstance led her to Christ), she discovered true liberation and complete healing of her emotional and spiritual wounds through the transformational power of Jesus Christ. In To Women with Love, Charlotte Posa equips her readers with effective ways to stop the vicious abuse cycle, to set realistic boundaries, and to stay free by cultivating healthy relationships. Moreover, she lays out key biblical principles for developing a Christian marriage, including love and respect, right communication, and God's intent for the roles of husbands and wives. "Those of us who have been abused need our little girl's heart on the inside of us healed," Mrs. Posa says. "It can be done, and we can then walk free of the anger and resentment! God's a good and merciful God. Nothing we've done or can do can keep His love from us!" Charlotte Posa married Wayne Posa in 1995. Both ordained ministers, they live in Fort Worth, Texas and have served the Lord together in local prison ministry for the past three years. Prior to that, they were involved in street ministry. (Nashville, Tenn.) One of Christian music’s most beloved pianist is ending the year with an exciting announcement: Zack Swain is engaged to be married! Swain will wed the woman he has been waiting for – Cherie Rowe - on a date soon to be announced. The winter wonderland proposal came at the Branson Landing in Branson Missouri, where she was presented the ring. Making her vocal debut on Swain’s newest project “Christmas from the Heart” Cherie proves she will be a strong reinforcement to Swain’s Ministry. Rowe is a full time CNA in Oklahoma but is also known for her strong vocals and powerful stage presence when on tour with Swain. The couple met through a mutual acutance in Oklahoma and the rest was History. Swain’s signature style behind the piano has an ever-growing fan base. His music is not only fun but also anointed and will be around for quite some time. “Christmas from the Heart,” released this year, features a song written especially for Cherie (Christmas From The Heart). As the snow begins to fall and the cold winds blow, many Southern Gospel artists start to plan their Christmas vacations. For most, it is a time to step off the tour whirlwind and relax with family friends while remembering the birth of our Saviour. This year, several singers shared with SGM Radio their favorite Christmas traditions and memories. Greg Bentley, A&R Director for Crossroads Music, Soloist : “I love Christmas. My favorite Memory of Christmas would probably be way back in 1974. We had just moved from Daleville, AL to Boone, NC and I was 11. Coming from the Deep South, we did not see snow, so I was excited that we might. It actually came early that year. We had a big snow at Thanksgiving and then another one at Christmas. That was my first White Christmas. There are many memories spending time with family too, it's a big deal in the Bentley / Teague families to get together. Thanks to all of our artists and friends who have shared their memories with us this year. From our house to yours, may you all have a very Blessed Christmas! SGNScoops Christmas Contest Starts Now!